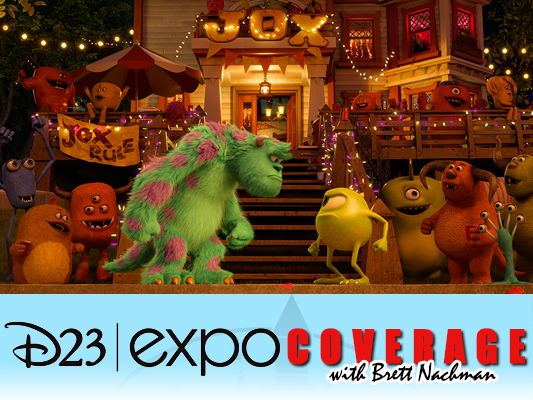 A new Monsters University short, titled Party Central, was shown today at the Animation panel at this year’s D23 Expo in Anaheim, CA, and was met with a favorable response from the crowd. Party Central, which will premiere in theaters in front of Disney/Pixar’s The Good Dinosaur in 2014, is ridiculously funny. We were shown the entirety of the short, which finds the Oozma Kappa gang sad that nobody came to their party. But Mike and Sulley bring the fun to their house – literally. Through the magic of carefully-arranged doors and some creativity, the pair share the fun atmosphere with everyone. Extremely witty and smart, I have no doubt audiences will fall in love with this short. The crowd at D23 loved it! See Party Center in theaters on May 30, 2014, with Disney/Pixar’s The Good Dinosaur. In related news, Disney announced today that the release of the Blu-ray and 3D Blu-ray for Monsters University will be on October 29, 2013. Both are up for pre-order now.